6'1" x 18.25" x 13.75" x 11"
6'6" x 18.5" x 14" x 11.25"
7'10" x 21.75" x 14" x 17"
9'0" x 22.25" x 14" x 17.25"
9'6" x 23" x 14.5" x 18"
All prices are for white boards. Solid glassing, concave or vee depending on wave size. 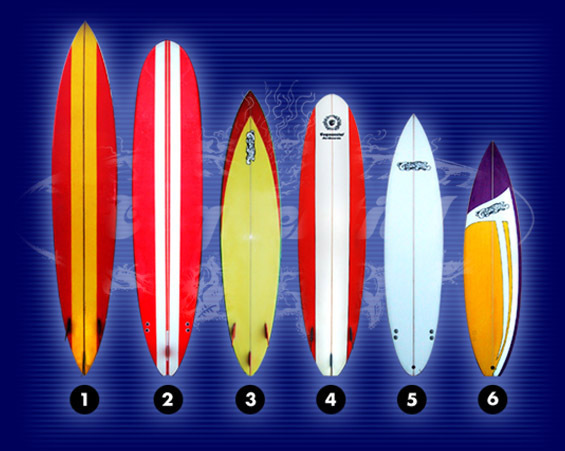 A full blown gun 7'6" and up would be roll to panel vee with large rocker, softer rails more volume & forward foils. A pocket rocket 6'6" - 7'2" may well be concaved, low volume for waves ridden in hollow, offshore, no chop, barrell conditions. Slight single in the nose with fair degree of rocker blending in double concave, vee'd into the tail. Tail rocker & rail more modern surfboard than old traditional mal. Single cutaway approx 8" with FCS side fins, polished finish. Generally flat front 1/2 to vee for all round stability and manouverability. Forward foils for paddling and glide, softer rails. Combinations of ideas, ellipses, bit of this and bit of that. kinda whatever you want`One off customers dream things. Lighter glass jobs, single to double bottoms for speed and looseness. Slightly rear foiled and squarer tail rail.